Ms. Lavanya Kanduri brings diverse experience of corporate sector and academics to her role at Hyderabad School of Business. She is an extremely dynamic and result oriented professional. Ms. Lavanya is determined to lead our organization to establish the highest academic quality standards and mentor the students to excel in their performance. 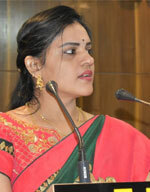 Ms. Lavanya has a successful track record, of conducting and concluding, the academic cycles for several batches of students as per Osmania University Graduate syllabi. She specializes in subjects like Management Accounts, Income Tax, Cost Accountancy, Advanced Financial Accounting etc. As a Senior Executive, in the Corporate Sector, she gained deep competence and experience in various areas of financial function. Some of the areas of her subject matter expertise include Transfer Pricing, Handling Internal & External audits, Multi-Location Coordination – to keep the books up to date, Developing & Establishing MIS for Corporate Leadership Review and Decision Making. Ms. Lavanya is a double Post Graduate and also has a Professional Qualification from The Institute of Cost and Management Accountants of India. She is an associate member of ACMA. She has a Masters Degree in Commerce and also has a Masters Degree in Business Administration with a specialization in International Finance.